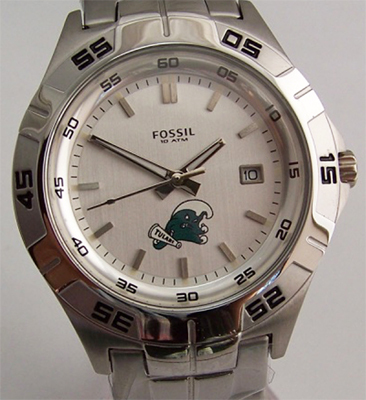 Click the button below to add the Tulane University Green Wave Fossil Watch Mens 3 Hand Date Wristwatch to your wish list. Tulane University Green Wave Fossil Mens watch with Date Display, New. Mens Three Hand Date wristwatch PR5338T with Applied Logo. 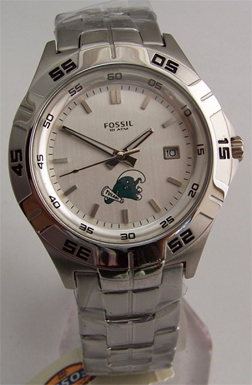 NCAA college sports fans team logo watches. Tulane University mens 3 Hand date analog sport logo watch. Team logo at 6 O'clock set on a white background in a light stainless steel case with a comfortable contoured stainless bracelet. Smart links can be easily added or removed by hand: no tools required. Case Size: 40 mm, Stainless steel band with folding Locking clasp, Date Display at 3 o'clock. Water Resistant: Up to 10 ATM 100 Meters/335 feet), luminous hands. Ships in a Fossil tin. Warranty: 11-year limited.